Ryegrass samples received prior to March and registered for pre & post emergent herbicides have now been tested and reported. Please check your email inbox for test reports or login to the Plant Science Consulting website & view online. The first quick tests have just been received. If you have herbicide failures & suspect resistance, please send survivors through now for early confirmation. Herbicide testing of brome and barley grass has been under full swing with registrations currently being assessed – expect test reports soon. The past month has seen a sharp rise in crop seed quality and herbicide tolerance registrations – expect reports to be emailed soon. Remember, if you’re planning on using old seed stocks (2 yrs +), a simple germination & vigour test done now may avoid crop establishment failures. 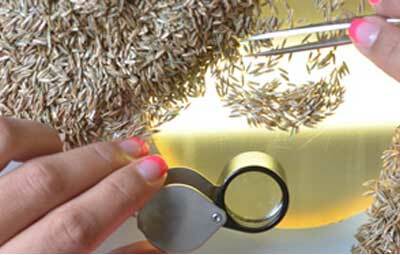 Save yourself the pain of re-sowing by investing in a seed quality test. Plant Science Consulting (PSC) is an Adelaide based company specialising in Herbicide Resistance Testing. The company was founded by Dr Peter Boutsalis who has been involved in Herbicide Resistance for over 25 years, both in Australia and overseas. PSC offers a wide range of tests including herbicide resistance testing of weeds as seeds & plants (Quick-Test). The Quick-Test was developed by Dr P. Boutsalis in the late 1990’s. He now works as an independent agricultural consultant and for The University of Adelaide researching herbicide resistance. Register your samples online and obtain a unique registration ID number. Write this ID number on your sample bag. Post your samples to Plant Science Consulting. Once the testing is completed, the report will be emailed to you along with a tax invoice with payment details. It couldn’t be any easier. Please note that there is a $25 incl GST fee for transferring the information from the paper copy into the electronic site. This fee will be included in the final tax invoice. A resistance quick test is very useful on assessing the level of herbicide resistance in a particular weed population, and helps to develop chemical strategies and other weed control methods in current and subsequent years. Herbicide resistance testing can make growers tens of thousands of dollars a year through improved herbicide and rotation choice. I find that being able to get quick results on the resistant status of weeds allows us to make a suitable salvage option and start to plan for next years control options. Peter, very happy with the Quick-Test reports, quick turn around, easy to understand and great info to be able to present to growers. Gives us a great advantage to understand what is happening in the pdk during the year and make decisions for future cropping and chemical use. Great service many thanks. Herbicide resistant testing has become an important part of managing resistance on our property, we use it both strategically (determining which paddocks to remove from cropping) and tactically (deciding on what herbicide groups will work in specific paddocks we suspect of having resistance). Thankyou for the Quick Test results. We suspected it had some resistance to glyphosate – now it is confirmed, with an indication to the degree of resistance. We now have the ability to choose other herbicides and non-herbicide tactics to reduce, and hopefully kill the population.